Deconstructed Artichoke Press: "Nikki Thompson enjoys obscure, innovative literature and the fine craftsmanship of outdated technologies and "women's work." She likes the craft even better if it has a cantankerous Union history. She uses these crafts to make artist's books that investigate structure, material, and image in terms of poetry, both hers and that of poets she likes. Her work frequently uses metaphors of science and architecture to explore isolation and relationships." San Francisco, California: Deconstructed Artichoke Press, 2012. Edition of 20. 7 x 7” closed, opens to 10” x 38, 28 pages. Two accordions. Letterpress printed on Somerset in Centaur 14 pt. and Arrighi 14 pt. Photographs printed on an Epson Stylus Photo R3000. Bound in blue cloth boards with red stitching. A young woman's thwarted passion to play a game considered the private bastion of males is told in 5 sections, each named after a Dodger player – Jackie Robinson, Pedro Guerrero, Steve Garvey, Kirk Gibson, and Dusty Baker. Nikki Thompson: "A little bit humorous, a little bit bittersweet, Dodger Blues tells the story of a softball player's gender issues and the misery caused by family and friends. Each [vignette] is named after a Dodger player. Two accordions, bound as three diamonds, with 108 stitches represent the 108 stitches on a baseball (or 216 depending on how you count it). Inside each diamond are photographs of a baseball field taken with a pinhole camera." San Francisco: Deconstructed Artichoke Press, 2010. Edition of 50. 4 x 6 x 1.5"; 82 pages. Handset in Centaur 14 pt. Hand cut linoleum blocks. Printed on a Vandercook SP15 on Lenox paper. 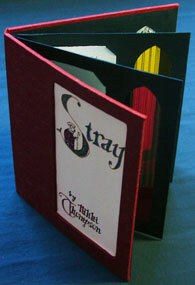 Housed in a folding-paper case-style wrapper with slip in closure and title printed on front. This series of seventy-eight short prose poems written by Judith Serin is matched with images by Nikki Thompson of walks, home and work, and pain. How to Use These Cards As a Tarot Deck: "We hope that you will use Days Without (Sky) as a tarot deck. The images on the back of the poems indicate the suits. The cracked plate is swords, the chair and pitcher are cups, the train is wands, the cat in the window is disks, the flying goose is the major arcana, and the scrubjay in the flowerpot is all other material. Since the numbers or royalty titles are on the other side with the poems, close your eyes when picking cards. We hope the poems will add to your interpretation. " California: Deconstructed Artichoke Press, 2007. Edition of 20. 5 x 4" closed; extends to 17". Handset In Centaur on Arches paper. Printed on a Vandercook SP15. Covers Gocco printed in Centaur Swash Capital. Based on a structure by Kumi Korf. Nikki Thompson: "... yet another book about architecture and love gone bad. Five poems that describe failed relationships use metaphors from engineering and construction. Letterpress printed on Arches, using hand set type and pressure printing, with a little bit of Gocco printing for flair. 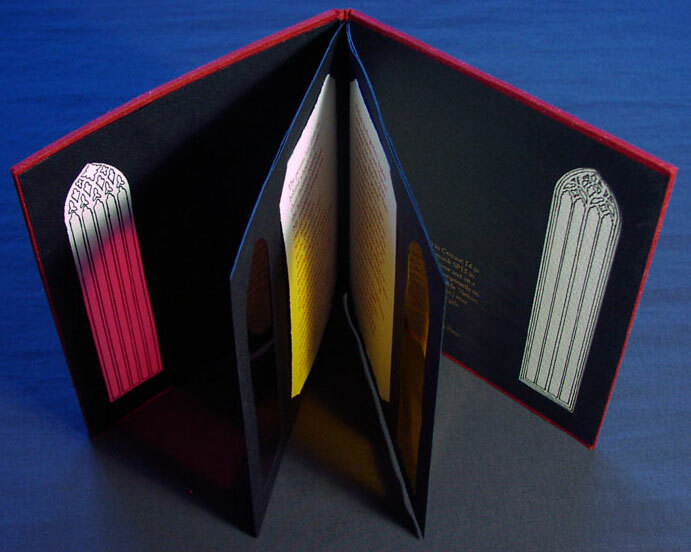 Each poem is an individual book sewn to an accordion structure that allows the book to open dramatically. The sumptuous wine-red Shindanshi paper and dark red book cloth create a brooding mood of heartbreak." 2005. Second Edition of 30. 1.25 x 5.5"; 20 pages; 3.4 x 6" laid-in insert. Pencil included. Typeset in Adobe InDesign using Minion and Gill Sans. Printed with an Epson Stylus Photo R200 on newsprint. Nikki Thompson: "This book is based on actual experiences, either mine or classmates of mine, going through Mild/Moderate Special Education Credential Program at the University of San Francisco. Frighteningly enough, there was very little exaggeration or manipulation of facts in creating these questions. Although this book is meant to be humorous (and a rant on my part), this is a frightening state of affairs for teachers who are committed to the work they do, as well as and even more importantly, the students who attend these public schools in San Francisco and throughout California." 6.25 x 7.5" with three pages plus title page. Letterpress printed. Full-cloth cover, inset with Gocco-printed illuminated manuscript image. Stained-glass window cutouts accompany the text. A poem by Nikki Thompson about a working class Jewish girl attending an upper-middle-class Catholic school. Full of Deconstructed Artichoke Press's quirky humor. — measuring time until the end. 4" x 4”. Inkjet and Gocco printed. This square blue book is essentially an origami with chapter headings: Subtractions, Luminosity, Mirroring (where the type is also backwards). When this book is completely opened and turned back on itself, you have a perfect star. Despite the crowding of the sky on a clear, starry night, isolation is the overwhelming feeling when the distance from one star to the next is considered. “Disconnected Constellations” is a series of five prose poems that use metaphors of physics and astronomy to create a psychological landscape of isolation. The spare, typographic layout reflects the emotions portrayed in each poem. This origami fold book structure opens up into a star to reveal illustrated constellations on the outside of the book. Viewed in this manner, a distance is created between the artist and the viewer, further heightening the sense of isolation. Paradoxically, as a reading experience, the reader is brought inside the artist’s consciousness both visually and thematically through the physical and emotional structure of each page. 4.75" x 3.75”. Inkjet, laser, and Gocco printed. Attraction is a mysterious thing, even more so when looked at in the metaphoric context of architecture. 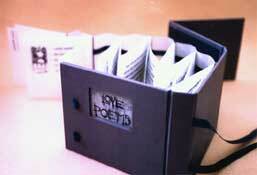 “Love Poems” is an ironic look at love through the funky black-framed glasses of a quirky architecture aficionado. Six prose poems are housed in an elaborately engineered structure that opens and closes progressively to reveal yet another layer to love and relationships. 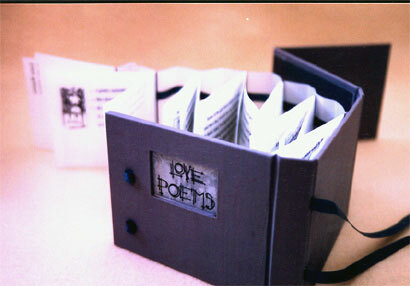 Each poem is an 8-fold book printed on vellum and sewn to steel wire, which is in turn sewn to an accordion structure. The text is accompanied by original illustrations, which are revealed to the reader through cut outs. San Francisco: Deconstructed Artichoke Press, 2006. Edition of 20. Twelve 1.9 x 4.1" oblong flipbooks. Perfect bound. Inkjet and photocopied on Wausau Gray Exact Index 110 lb. Covers Gocco printed on Canford Imperial paper. Typeset using various means: light table, Photoshop, InDesign. 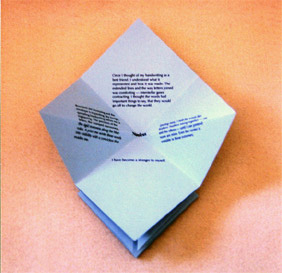 Nikki Thompson: "Based on Julio Cortazar's pieces 'Preamble to the Instructions on How to Wind a Watch' and 'Instructions on How to Wind a Watch,' from Cronopios y Famas, published by New Directions in 1999 (originally 1962). Fabulous book: read it! The specific line, 'Think of this: When they present you with a watch they are gifting you with a tiny flowering hell...', inspired the drawing." San Francisco, California: Deconstructed Artichoke Press, 2007. Edition of 50. 5.75 x 7" manila folder resembling a police report. Inkjet printed on an Epson Stylus Photo R200 on manila folders and newsprint. Typefaces: Minion, American Typewriter, and Impact. All pseudonyms are really Nikki Thompson. Photo and paw print kindly contributed by Billie Holiday Thompson, the artist’s pit-boxer mix. Nikki Thompson: "I decided to write these satirical articles to make fun of the negative press that pitbulls get in the media and to advocate for what wonderful dogs they are. My pitbull rescue is a sweet, mellow dog who has been known to get chased by Chihuahuas and bully cats. Her favorite pastimes are cuddling and making new friends - human and canine. Pitbulls are not the vicious beasts the media portrays; the problem is irresponsible owners.
" ... All stories are sort of true."